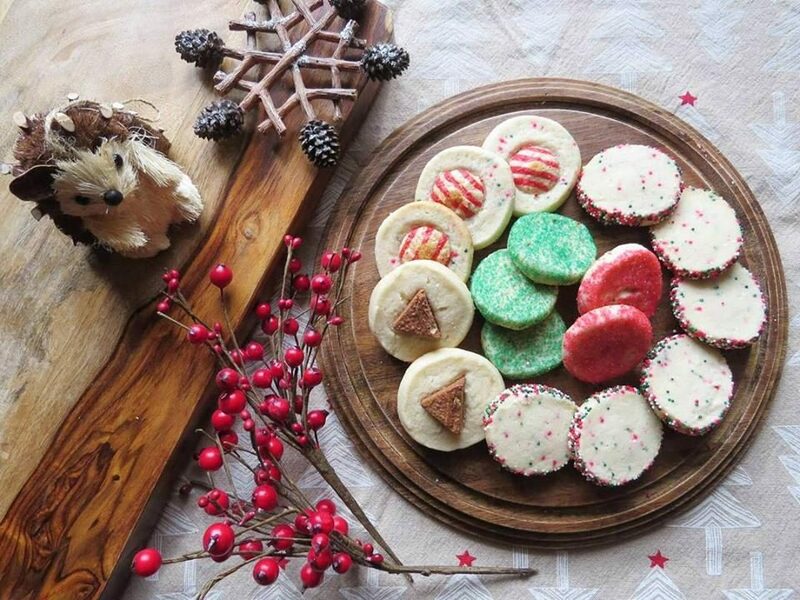 For me, the holidays aren’t complete without holiday baking and cookie jars filled with delicious homemade cookies. I bake shortbread cookies, sugar cookies, and gingerbread cookies all throughout the month of December and the kids help me decorate and package them for friends and family. Of all the cookies I have attempted to make over the years, shortbread cookies are by far the easiest cookies to make. They require only a few good quality ingredients and can be prepared with great ease. I am slightly paranoid about letting my children work with cookie doughs that contain egg in fear of them contracting Salmonella but with shortbread that isn’t the case. 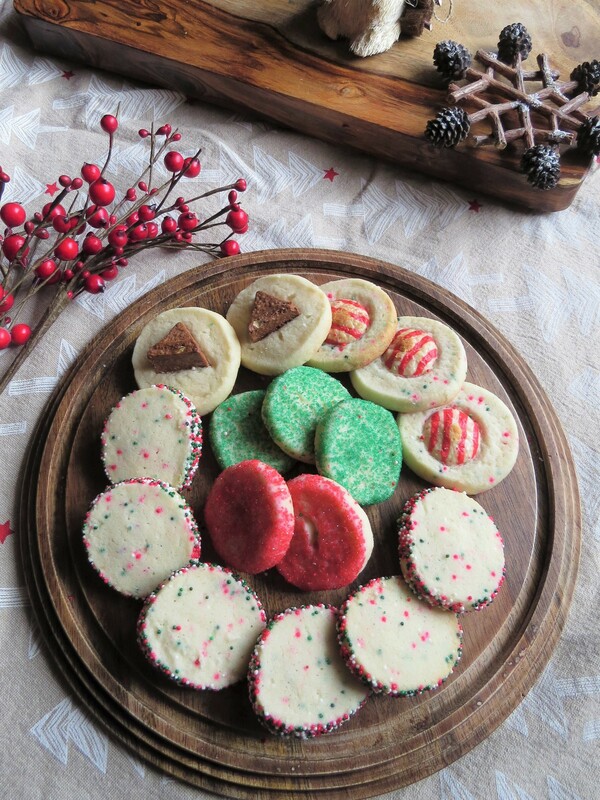 Since shortbread cookies contain no eggs, it is a great choice for vegetarians and those with egg allergies. Shortbread, which originates from Scotland, is a cookie made of typically one part sugar, two parts butter, and three parts flour. However, my recipe includes cornstarch for a better texture, and pure vanilla extract for a wonderful aroma. Akshaya and Udayan like to use sprinkles and coloured sugars to decorate the otherwise simple shortbread. During the holidays we press Hershey’s kisses or a piece of Toblerone in the centres right before baking. Nuts such as peacans and almonds are a great addition too but since I like to send these cookies to school as treat, we avoid using nuts to respect the school’s Nut-free policy. Combine the flour and cornstarch and set aside. Using an electrical mixer, cream together the sugar, butter, and vanilla. Slowly add the flour mixture until the flour is well combined. The cookie dough will be soft. Using a tablespoon, drop cookies on a cookie sheet lined with parchment paper. The cookies should be 2 inches apart to make sure they don’t get stuck together during baking. Top with your choice of sprinkles, coloured sugar, chocolate, or nuts. Place the cookie sheet in the freezer for 10-15 minutes or until hard. This will help the cookie dough from spreading too much during the baking process. Bake cookies for 12-15 minutes in a 350 degrees Fahrenheit oven or until the bottom of the cookies turn golden. Let cookies cool for five minutes on the baking sheet before removing them to finish cooling on a wire rack. Always use real butter for best flavour. This is NOT a recipe for rolled shortbread cookies. Even after refrigeration, the dough is quite difficult to roll out with a rolling pill. Instead you may wish to roll the cookie dough into four logs, wrap in saran wrap and freeze for 15 minutes. Once dough slightly hardens, you can slice the log into perfect circles for a neater presentation. Alternatively you can use a cookie press or piping bag to pipe out the cookies, without refrigerating the dough of course.